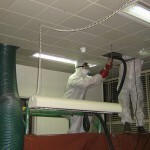 Duct Cleaning Could Be The Healthiest Business Investment You Will Ever Make! A building’s air duct network acts as its respiratory system. Dirt, dust, debris and microbial growth that accumulate inside of air ducts hidden from view “congest” the system and make it difficult for the building to “breathe” properly and function efficiently. More than 70% of all IAQ (Indoor Air Quality) problems involve the HVAC (Heating, Ventilation & Air Conditioning) system. Dirty air ducts are an ideal breeding ground for mould spores, mildew, bacteria and other health-threatening microbial growth. Dirty air ducts can also result in higher utility bills, reduced air supply and premature failure of expensive HVAC components. Our high quality commercial duct cleaning service enables our clients to provide ultra clean indoor air and to realise the common sense business advantages that accrue from a well maintained air duct system. Using state-of-the-art equipment and source removal techniques, our crews are able to access and thoroughly clean the entire duct system. Our experts are available to call out and evaluate your system, then customise a cleaning and maintenance schedule to suit your needs and budget. Call AM Coil today to arrange an inspection.